Hans Rudolf Giger, born on 5th February 1940 in Chur, Graubünden Switzerland, was a surrealist painter, best known to the world for his airbrush images in which he depicted humans and machines as one in a “biomechanical” relationship. As he got older he switched from airbrush to other works, including markers, ink and pastels. Hans passed away in 2014. Have you ever wondered how rich H. R. Giger was at the time of his death? According to authoritative sources, it has been estimated that Giger`s net worth was as high as $5 million, earned through his career as an artist. Apart from having his own work exposed, he also collaborated with musicians, designing album covers for such artists as Emerson, Korn, Deborah Harry and Dead Kennedys, among others. Furthermore, he worked on films, most notably “Alien”, for which he won an Academy Award with the rest of the designing team. Hans` father was a pharmacist, and from early age encouraged Hans to follow his steps, but young Hans had other plans. When he turned 22 he moved to Zürich, and enrolled at the School of Applied Arts, where he studied Architecture and industrial design. At the beginning of his career Hans used airbrush, but later moved to ink drawings and then eventually oil paintings. He eventually became known for his nightmarish surreal dreamscapes, and influenced by Dado, Dali and Ernst Fuchs, he brought something new to surrealism, his interconnected relationship between humans and machines. He published several books of paintings, with the best known “Necronomicon” and “Necronomicon II”. In 1979 he was a part of the special effects team which was responsible for creating Alien for the film “Alien” (1979), and for that venture he won the Oscar in the category Best Effects. He also worked on Alien sequels, including “Aliens” (1986), “Alien 3” (1992), “Alien: Resurrection” (1997), and has other designing credits, for such films as “Batman Forever”(1992) and “Poltergeist II” (1986) among others, all of which certainly increased his net worth. Griger has also directed a few films on his own; his debut was “High and Heimkiller” back in 1967, and since then he has directed such titles as “Swiss Made” (1968) and “Giger`s Necronomicon” (1975), among others, which successes increased further his net worth. Hans was also known for his interior designs; a number of bars – named Giger Bars – were opened in his hometown Chur, and in Gruyères designed by him. 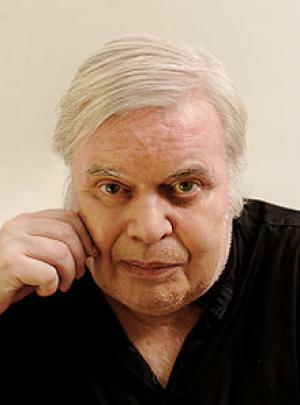 Regarding his personal life, Giger was married to Carmen Maria Scheifele from 2006 until his death in 2014. Previously, he was married to Mia Bonzanigo(1979-81). Carmen Maria now operates the H.R. Giger Museum, set in Château St. Germain in Gruyères, Switzerland. Also, in his name, Belinda Sallin directed the biographical documentary entitled “Dark Star: H. R. Griger`s World” (2014). Hans died in hospital after he succumbed to injuries he suffered in a fall, on 12th May 2014. 1 Inducted into the Science Fiction and Fantasy Hall of Fame in 2013. 2 Giger was in a relationship with Swiss actress Li Tobler until she committed suicide in 1975. 3 Suffers from fear of flying, a condition necessitating that Ridley Scott visit him at his Swiss home in order to discuss his early design concepts for the beast in Alien (1979). 4 Suffers from Night Terrors, and keeps an artist's pad near his bed to draw out his nightmares. It was in this fashion that he came up with horrific designs of the monsters for Alien (1979). 5 Designed the limited edition poster (rows of copulating genitalia) that was included in vinyl copies of the Dead Kennedys' 1985 release, "Frankenchrist". Jello Biafra, front man for the Dead Kennedys consequently was arrested for including the artwork with "Frankenchrist", due to its sexually explicit nature. 6 Designed the highly controversial and surreal cover art for Emerson, Lake and Palmer's landmark progressive rock album "Brain Salad Surgery". The cover art was originally deemed too sexually explicit to be shown on store shelves, but was edited before release. Giger's design for that ELP album stands out as one of the best examples of 1970s record cover art to this day. 7 Designed Korn vocalist Jonathan Davis' microphone stand.